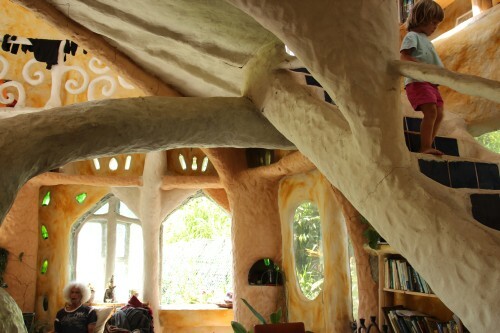 If Dr Suess was a house-builder, this would be his home. 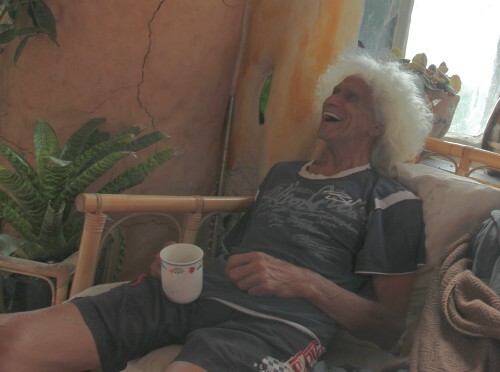 Walking around the Pineapple House is a parade of delights, thanks to the hard work, imagination and determination of Clinton Scott. 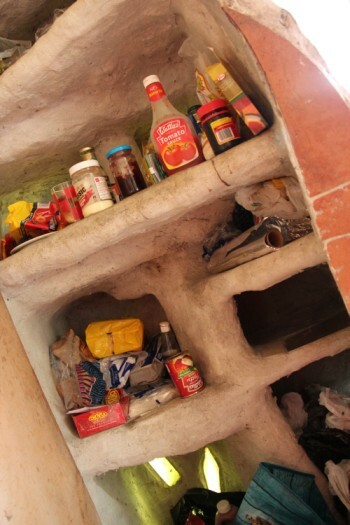 While we were staying at La Hacienda last week, David used a free day to assist some locals with construction work. 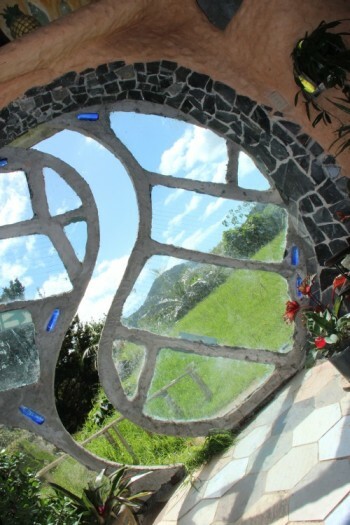 He didn’t know that he would be working on one of the most imaginative houses in New Zealand. 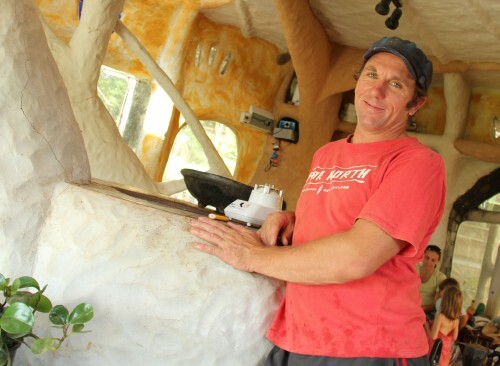 Clinton Scott has a pineapple farm on the Karikari peninsula, and —inspired by the Spanish architect Antoni Gaudi —he mimics the organic shapes of bromeliads in his construction style. 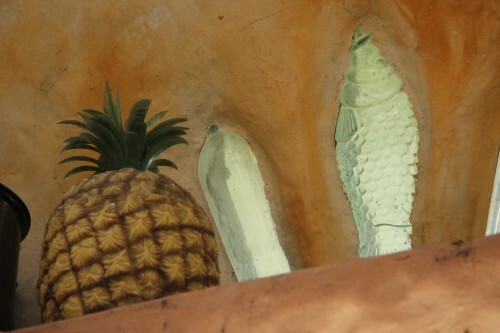 Today we returned to the Pineapple House so I could have look around. When we explained to Mandy that we were going to see Clinton’s house today, she, her mum Janet and the girls decided to come too. 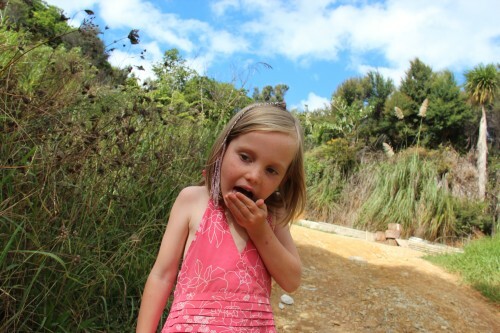 Uncle agreed to drive us up the steep driveway in his four-wheel-drive car. It was quite a party of visitors that descended on the unsuspecting Clinton, but he is a gracious host and welcomed us in, inviting us to look around freely. 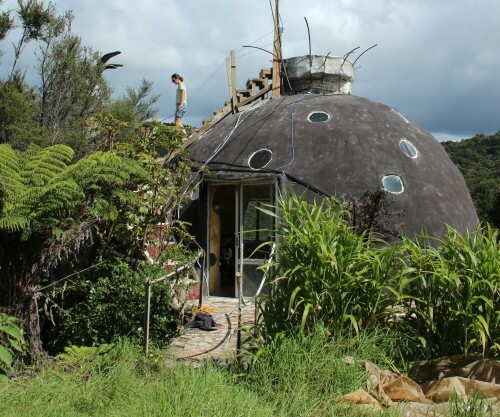 The top of the Pineapple House rises as a dome over the bush landscape. It still waits the fleshing out of its crown of leaves. 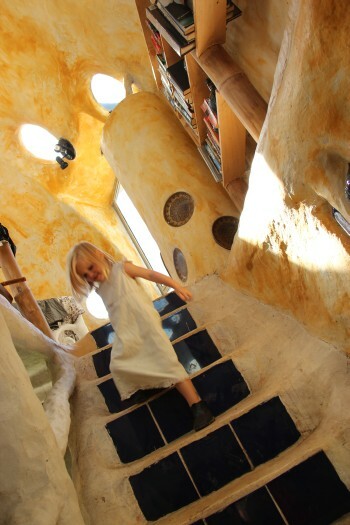 Clinton Scott is the architect and builder of this fantastic home near Fern Flat. Clinton’s website for his wood-fired ovens business has more information on the compound he has developed for use in construction. 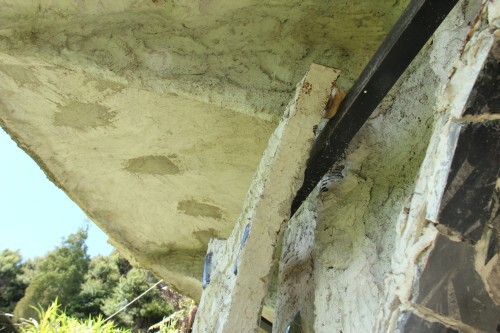 He calls the material Darjit and says it is a blend of china clay, rock powder (a by-product of mining) and cellulose fibre from recycled paper products. 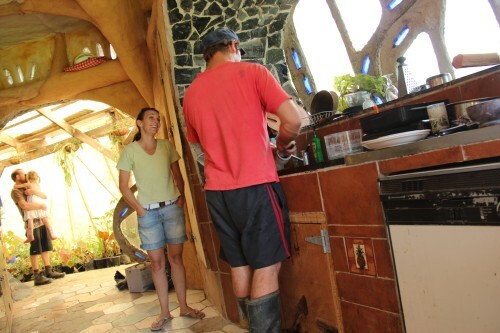 It was lovely to hang out with Mandy and her family some more as she looked around the Pineapple House with us. The interior of the house is a mass of sumptuous curves and light. 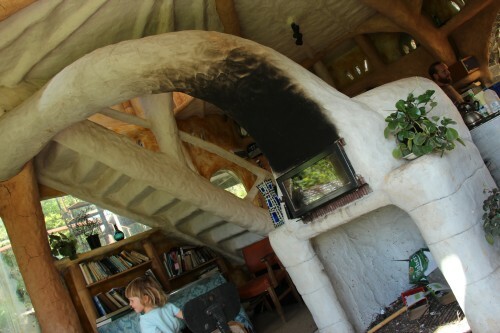 The centrepiece of the main floor is a huge wood-fired oven. It warms the house, heats the water and cooks food. The exhaust fan opens as a floret over the stove. 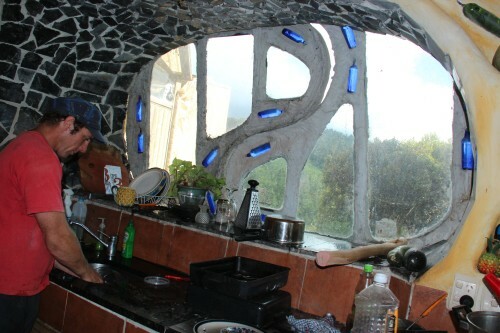 The kitchen windows also make a beautiful yin-yang. 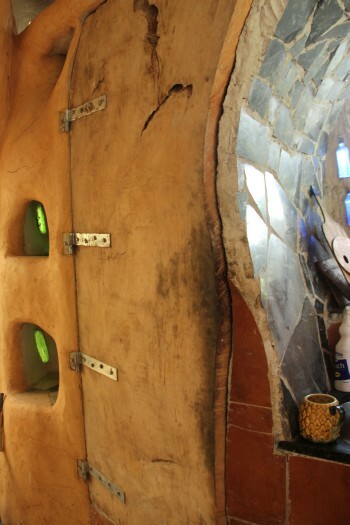 The huge doors and windows hang on runners and slide across their openings. 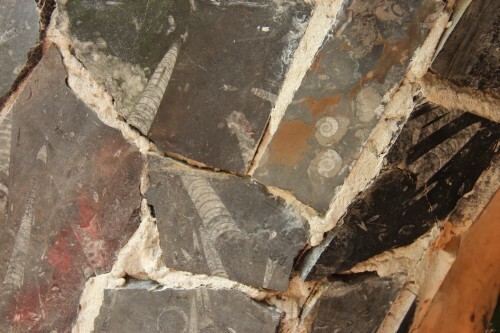 Fossilised remains in the rock frame the doorways and the main kitchen nook. 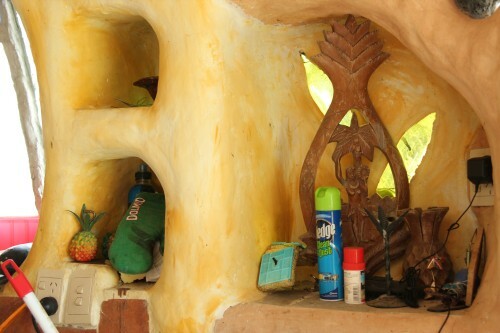 In little niches, a varied collection of pineapple kitsch reminds the visitor of Clinton's inspiration. Even the pantry door is irregularly shaped. 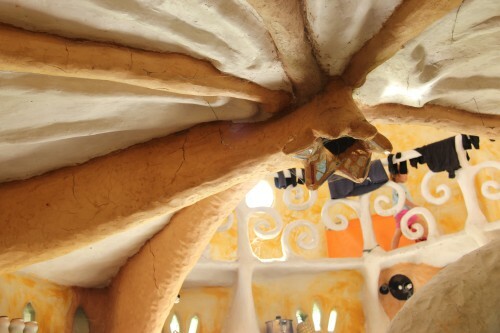 Inside the pantry, the same style of imaginative construction has been applied to the shelves. 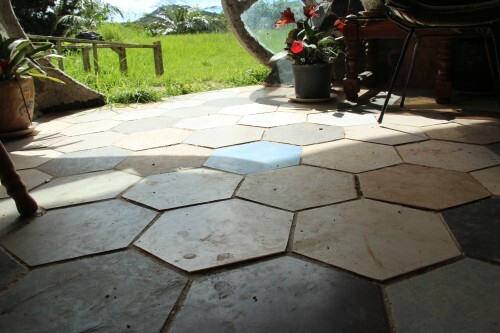 The floor tiles in the house are hexagons. A closer examination shows that Clinton cut the corners off each square tile in order to turn them into hexagons! 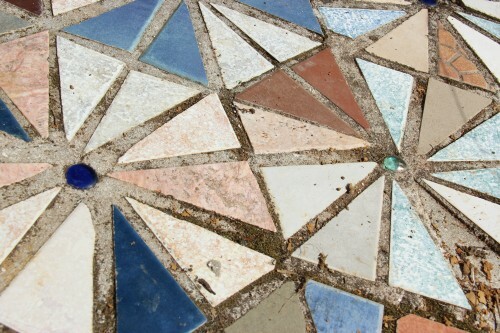 The corners of the tiles are used elsewhere as floor decoration. Tile-studded stairs lead to other levels. 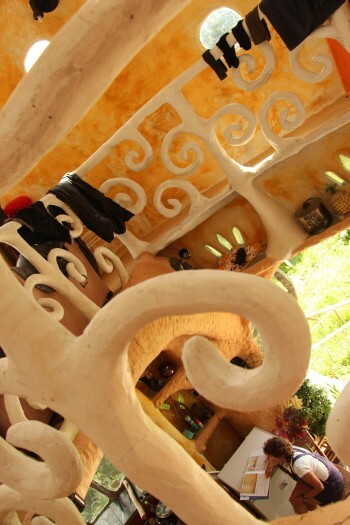 The balcony around the second storey is made of Dr Suess curves. 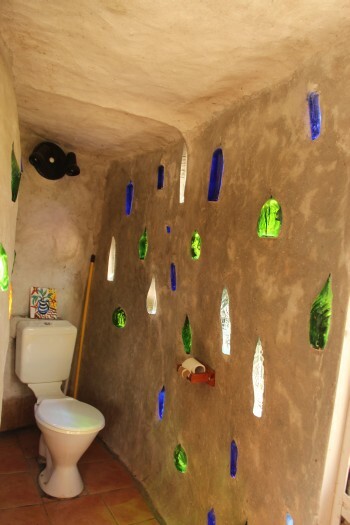 The wall to Clinton's walk-in wardrobe and bathroom is decorated with particularly beautiful bottles. Skylights provide additional light. 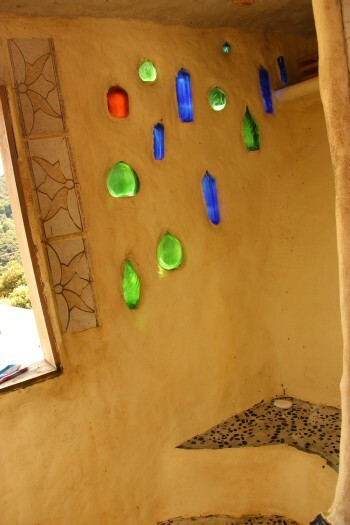 Even the shower wall is studded with bottles. Clinton has designed and built a flushing composting toilet. It handles the fluid waste and solid waste separately. The kids had a terrific time exploring the different levels of the house (although we tried not to watch them when they hung over the balcony without fear). The smokestack for the internal oven doubles as a fish smoker. 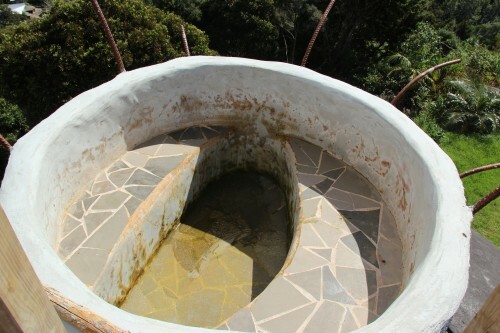 Clinton has built a hot spa bath at the very top of the dome. One day it will be surrounded with leaves to resemble the top of a pineapple. 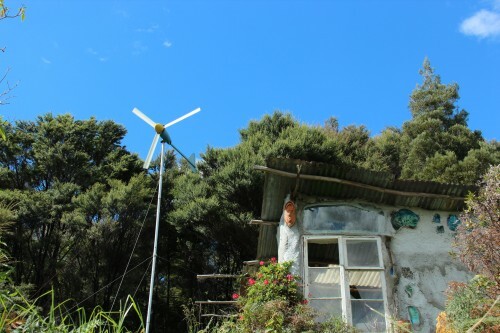 The property runs on a combination of wind and hydro electricity. When Clinton needs to use a welder or other power-hungry tools, he starts a generator. 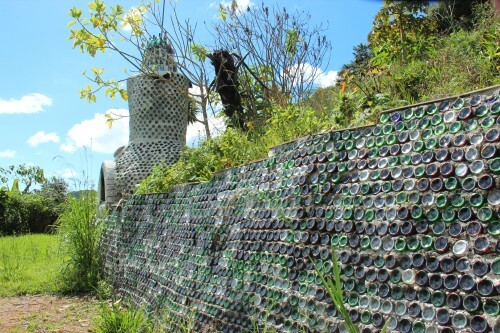 Outside, a retaining wall is made of glass bottles. The large structure is a wood-fired oven for making pizzas — Clinton's speciality (making ovens). Clinton has a pineapple farm further north near Rangiputa, growing hardy red pineapples for fruit and the florist trade. Clinton has been working on his home for eight years, and it’s possible that it will never be finished. However, he has demonstrated that he has the stamina to bring his grand visions into reality. When he explains how things will look in the future, we certainly believe him. Uncle says he has never visited a house like this one. He joked to Clinton that this place would give him nightmares. 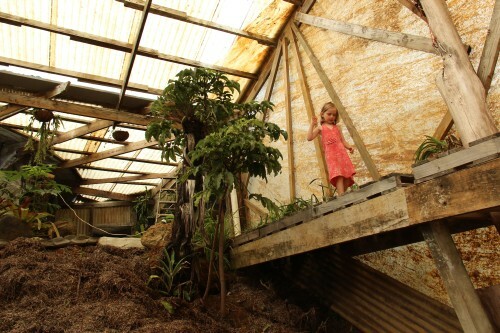 Off to one side of the Pineapple House is the framework for what Clinton calls "Eden". 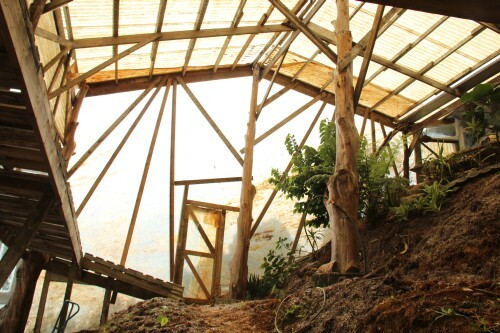 The frame to Eden will one day house a beautiful atrium and butterfly sanctuary. Walking around Eden is currently on a walkway built of timber pallets. 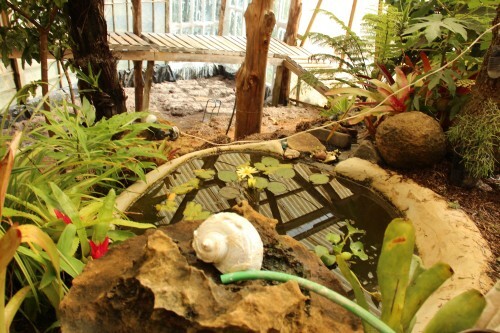 Clinton is still propagating the plants that will grow within Eden, and he's started putting water features in place. 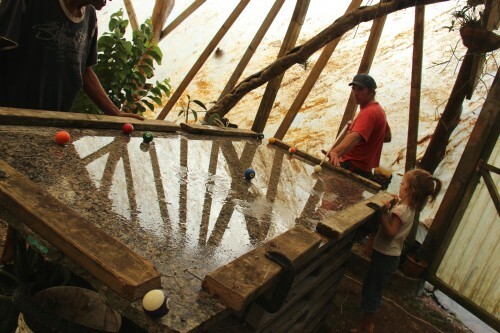 Up the top, a water-slickened piece of granite serves as a pool table. 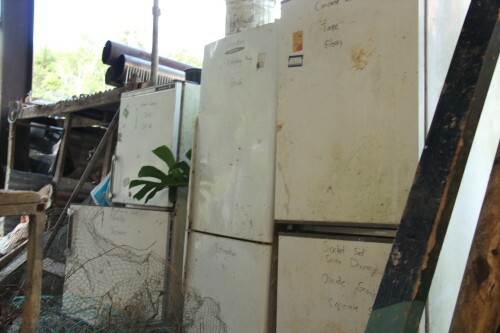 Out in the back shed, Clinton has a collection of old refrigerators that serve as cupboards for his well-indexed tools and building materials. 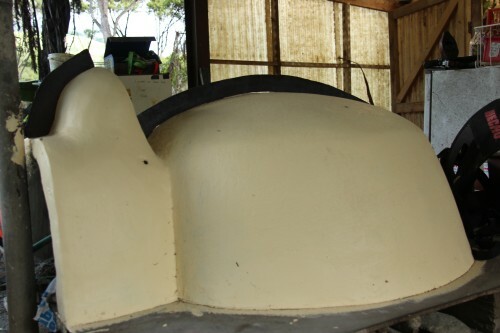 A fibreglass mould awaits its use in building a pizza oven for a client. 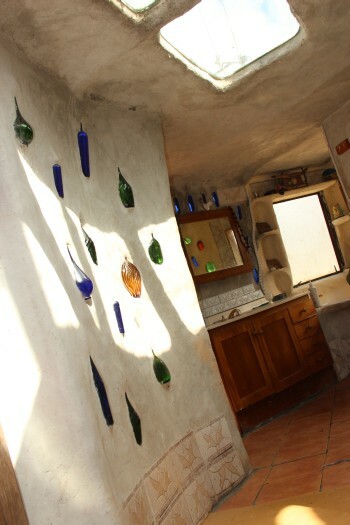 Many of Clinton’s ovens for clients reflect his imaginative construction style. I’m amazed by what is possible by daring to think outside the norm. 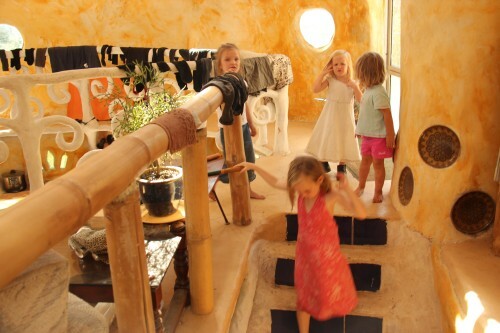 The girls played in and out of the Pineapple House. 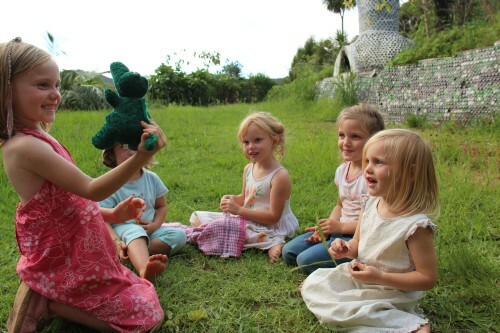 At one point, they sat together on the grass and played "Pass the parcel", mimicking the game from Saturday's party. It’s been an amazing day. 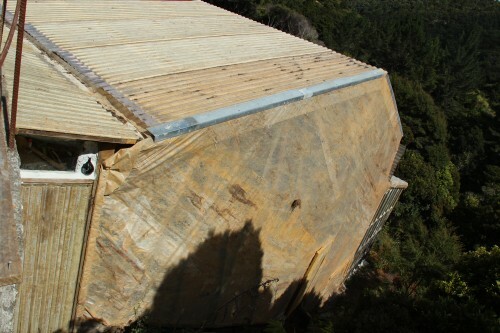 Walking around the Pineapple House is inspiring and makes me wonder why so many of us live in very plain, boxy shapes. 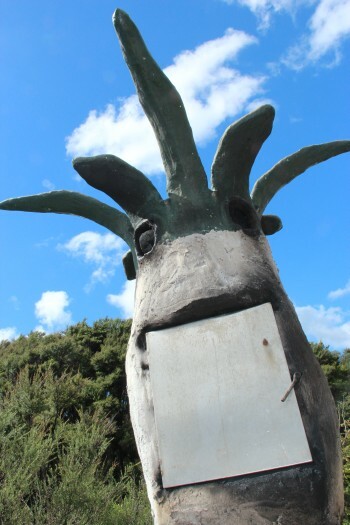 We’re privileged to have seen one of the true artistic wonders of Northland today. I enjoyed very much your blog! The pics are wonderful. Hi Lauren, loving you travels. This house is amazing!! a real inspiration! hopefully we will get to visit it oneday!! Hello, my name is Emil, just want to ask some questions about a fibreglass mould to build a pizza oven.